Co-branding, involving a cricketer and a retailer. Tasty Treat, Home and personal care range with Cleanmate & Caremate, staples with Fresh & Pure and Premium Harvest – comprise the already successfully launched private brands (in the food range) by Future Group. The introduction of ‘Sach’ is expected to be a big leap for the company when it comes to working towards building the company’s private brands portfolio and that too via its association with an iconic personality like Sachin Tendulkar. Kishore Biyani, Group CEO, Future Group, said, "We are extremely pleased to partner with Sachin Tendulkar, a persona every Indian would like to emulate to co-create brand Sach. We are confident that Sach will succeed in building an emotional connection with our consumers." Very clearly, the initiative gives an opportunity to Future Group to co-partner with a brand where it’s beyond endorsement, and ‘ownership’ to build, lies with both the parties. Future Group private brands have always launched their products keeping ‘Indianness’ in mind through consumer’s insights. ‘Sach’ will be primarily focusing on Indian families, especially the consumers who seek a combo of value with great quality. ‘Sach’ toothbrushes were launched last year and with the toothpaste category, the oral care range has been completed. More categories are expected to be launched in due course under the same brand. To promote any kind of brand, promotional strategy comes to play an important role. “Our stores are a medium to communicate about our brands. For ‘Sach toothpaste’ launch we have done the entire 360 degree of marketing and promotion, from basic ATL – full page print advertisements in top seven cities in store consumer engagement activation with ‘live toothpaste’ man walking around for getting consumer to sample the product. We also had graffiti walls where consumers can leave their wishes for Sachin. Every pack of toothpaste has a coupon which is sms based contest and winner can get personally autographed bats by Sachin,” adds Chawla. 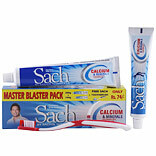 ‘Sach toothpaste’ will be available in white paste (100g) enriched with calcium & minerals for stronger teeth and includes red (80g & 150g) & blue gels (80g) combined with dissolvable mentho cool beads for long lasting freshness. Great team work, huge amount of active selling in store and lots of innovations are awaited!